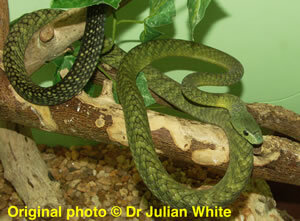 Large in length, slightly compressed, very slender bodied snake with a medium length tapering tail. Can grow to a maximum of about 2.65 metres. Head is narrow and elongate, with a distinct canthus and slightly distinct from neck. Neck may be flattened when snake is aroused, but there is no real hood. Eyes are medium in size with round pupils. Dorsal scales are oblique, smooth and narrow. Dorsal scale count 17 ( 15 or 19 ) - 17 ( 15 ) - 11 ( 13 ). Elevations up to about 2200 metres in primary and secondary rainforest, woodland and thicket. It will persist in areas where land has been cleared providing there are still thickets and trees to hide in. Often found around buildings and towns within forest, in parks and around farms. Diurnal and mainly arboreal. It will descend to the ground in pursuit of prey. Alert, nervous and extremely agile snake. Will attempt to escape if approached or threatened. In defence it will spread its narrow hood or flatten its neck. It may strike if cornered or provoked. Actively pursue their prey, striking rapidly and often until prey succumbs to the venom. Feeds mainly on birds and rodents. 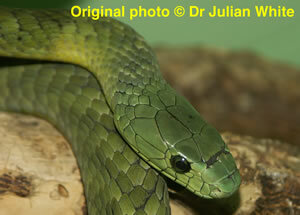 Mamba bites can cause severe, even lethal systemic (paralytic) effects. They require urgent assessment & treatment. Admit at least overnight. Urgent antivenom therapy is the most important treatment.